Since Valentine's Day is actually on most calendars, I suppose I have to recognize its existence. While I'm not too keen on the premise, I do love hearts and the color pink is growing on me (not literally...last time I checked). Those things being said, I give you pink and red heart-shaped meringues. *I streaked the pastry bag with red and pink gels. *I used only vanilla extract, though I'm thinking something like a hint of Kahlua might be delicious and appropriate. *Instead of just making meringue blobs (or, in some cases, walnuts), I made hearts. Pretty festive, right? Especially for someone who tries to ignore the annual flowers-and-chocolate fest known as V-Day. Have a great Valentine's Day. They are lovely! I wonder if you could pipe the hearts over a dried raspberry or something so you had a little surprise in the middle when they bake? Okay, these are adorable! The streaks are almost hypnotizing! These are really quite beautiful Grace. They are also so much better for us than all of the calorie laden chocolate treats this time of year. These are so so adorable, Grace. I'd float a few of these in a big mug of hot chocolate---gorgeous! I want to make these for MYSELF for Valentines Day... they look so pretty and delicious. I've always loved the color pink-- you know, I've still never had a meringue? I'm ashamed to admit I've never tried to make meringues. They seem fussy and scary to me. I am not on Valentines mood either, but these hearts are so beautiful and they are a very pretty way to celebrate! Hope you are enjoying your week! You can't beat meringues (pun not intended there, sorry). And your version is a lovely Valentine variation. well hey now, those came out great! Those are so beautiful,Grace!I love meringues...Yours are perfect! 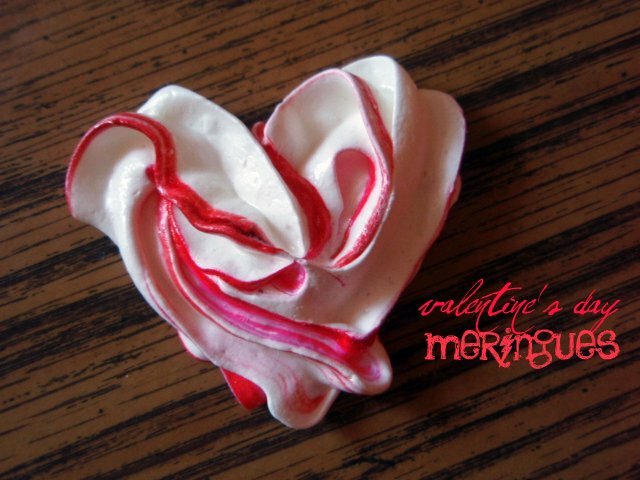 Your heart shape meringues are delightful. This beats out chocolate any day in my book. So creative and beautiful. Anyone would be lucky to get one of these lovely hearts for Valentine's Day. These are so cute--I am amazed this is even possible! Well if anyone could do something like this, you could! Oh my, these are so lovely. Sorry I'm just getting to see them now. But there's always next Valentine's Day.